Jane Masters, photo by Scott Lapham. The art of Jane Masters is multi-faceted, like the artist’s upbringing and education. Born in 1962 in London, Masters grew up in Europe and the West Indies, where her father owned a hotel. She received an undergraduate degree in art and art history from the College of William and Mary, a BFA in ceramics from the Kansas City Art Institute and an MFA in sculpture from San Jose State University. Masters makes drawings, prints, art wallpaper and architectural installations; as large scale as her work can be, the hand is at the center as she explores the borders between abstraction and pattern. Masters has showed her work nationally and internationally, completed large installations for Fidelity Investments and the Chambers Hotel in Manhattan, and been an adjunct instructor at numerous schools. 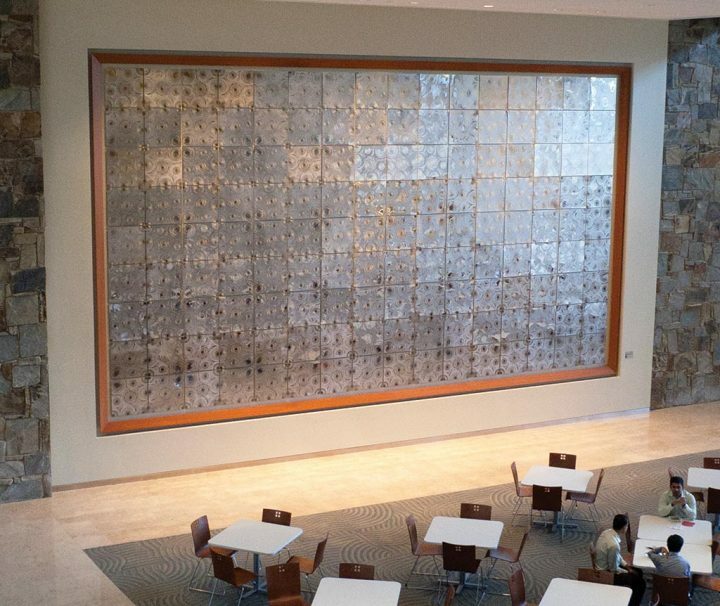 144 panels, nickel-silver plated etched brass, 18 ft. x 32 ft. x 1.5 in.